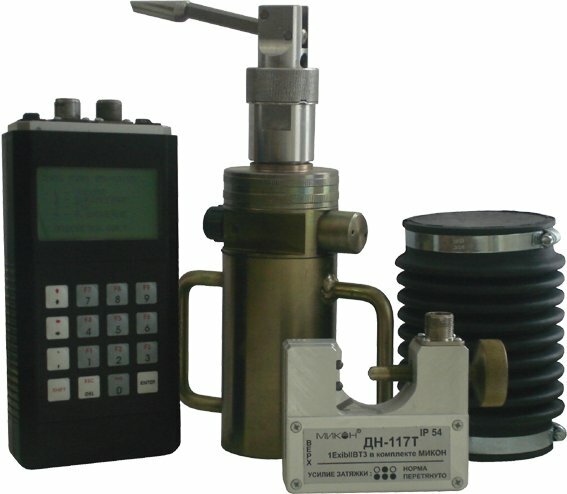 System MIKON-101 is designed to determine the liquid level depth and measure the casing pressure and for the routine dynamometer monitoring of wells with a submersible pump. The software Measurements Manager is shipped with MIKON-101 system. The system is produced according to GOST 22782.0-81 and GOST 22782.5-78, rated as “explosive safe electric equipment” with explosive safety “spark free electric circuit” and marked as 1ExibIIBT3 in MIKON-101 set (certificate CS VE IGD 2000.C86). System MIKON-101 has a measurement equipment certificate RU.C.30.041.A 11843 and is registered in State Registry of Measurement Equipment as No. 22659-02. Registration unit is designed for registration, calculating and storing echograms and dynamograms. It has graphic display and keyboard. Power supply is AA type accumulators or non-rechargeable batteries. Protecting cover and built-in display heating system, spare accumulator set and charger is included. Acoustic signal reception unit is designed to convert acoustic signals into electric signals and pressure metering. It has piezoelectric microphone, durable against hydrosulphur gas. Cramping screw is used for optimal cramping force adjusting. Acoustic signal generation unit is designed to generate acoustic signal in wells without exceeding pressure. It may be used for echo testing depth up to 600 m.
Horseshoe transducer is mounted between traverses of the pump unit hinge and allows to measure absolute load values exerted on the polished rod. The hoisting jack is used for mounting the transducer. CAUTION! Before mounting transducer, stop the pump unit drive. Threaded hoisting jack is designed to move apart the traverses and mount horseshoe transducer. Acoustic signal generation unit is designed to generate acoustic signal in wells without exceeding pressure. It may be used for echo testing depth up to 3000 m.